Everything perfect - transfer, apartment. Very friendly people. Will come back soon with our children. Back in Pristina/Athens with nice memories of our stay in Zagreb and your appartment. We enjoyed it very much and hope to come back soon! Thanks again for your help with the apartments. All three couples greatly enjoyed our stay in Zagreb AND the apartments. Your service was great, and we look forward to working with you again. The "White" apartment was perfect. It was very comfortable. It had everything I needed and is very well located. Thank you! We only stayed for two nights but we really liked the apartment. It has everything that someone on vacations need. It is near the centre and in a calm area. The apartment is very friendly and cosy. We will recommend it to our friends. Inzagreb is an excellent company and a pleasure to deal, always very friendly. Any information i needed about Zagreb was pretty much given to me asap. I would definitely book an apartment with them again. I felt like I was at home. Food store downstairs was very handy to have. Close to trams. All the home stuff I needed were in apartment, washing machine, Internet etc. Overall 10 out of 10 rating. Hvala! It was so good that you've left the spices even though I was not cooking. It is clean and cosy. 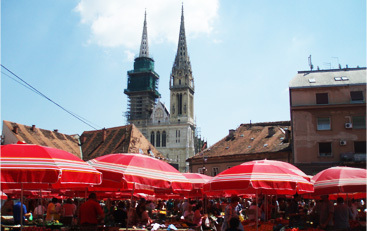 I liked it and I will recommend it to my friends coming to Zagreb. The apartment is comfortable, cozy, just right for a small family. Plenty of supplies, such as starter foods, soap, paper towels etc. Extras as ADSL, A/C perfect. We will definitely recommend the apartment to our friends. Thanks for a very nice stay. Draga Ivana, Stan White nam je bio divan, poput drugog doma. Uređen je s puno topline i ljubavi, vrlo je funkcionalan, a detalji poput školjkica, prekrasnih slika, cvijeća i voća čine boravak ugodnim i opuštajućim. Hvala Vam na svemu i nadam se da ćemo ponovno surađivati na obostrano zadovoljstvo. We were satisfied with everything and appreciated all service and information that were given. We were very happy with the apartment. We liked its central location and appreciated the local amenities,bakery, supermarket, bar etc. We also liked the small touches - welcome wine and fruit, extensive "what's on" information and provision of CD's, satellite television. We found it a very comfortable and quiet accommodation and would happily return. Lovely apartment in a very nice area, very friendly people (Ivana and Hrvoje). I would return here anytime. Just wanted you to know how much we enjoyed our stay in Zagreb. As you know we also stayed in Prague and Budapest but the accomadtions could not compare with yours. Yours was by far, the best. It was a pleasure to meet your husband and colleague perhaps next time we can meet you.